Your alternative to melting in the hot summer heat. 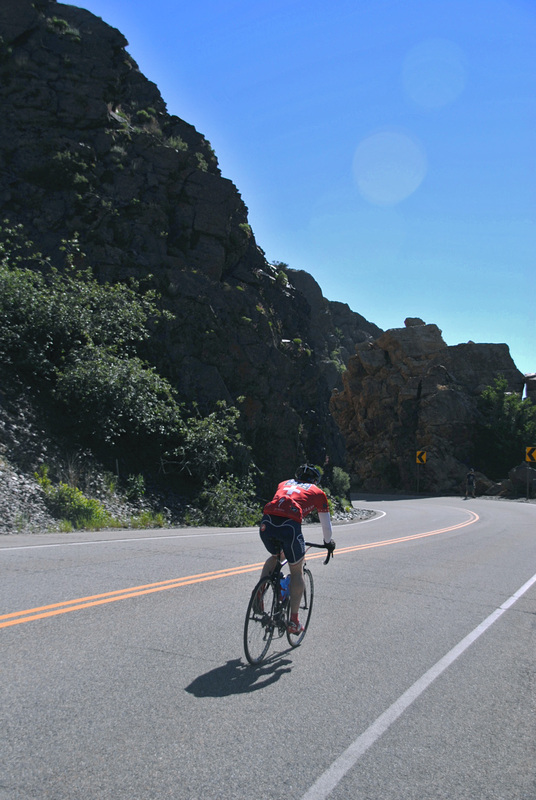 Biking Big Cottonwood in the summer is a great alternative to melting in the summer heat. Every Utah canyon has its own personality and distinct charm. Mill Creek has amazing hiking trails open also to dogs every odd day. City Creek’s proximity to downtown and its remote wilderness feel offers the perfect break after work. Emigration, Parleys, Red Butte — they all are like gracious friends extending cyclical seasonal hospitality. I could write an in-depth article on each one, but here I will focus on a recent trip to the oldest geologic and most historic Utah canyon: Big Cottonwood. 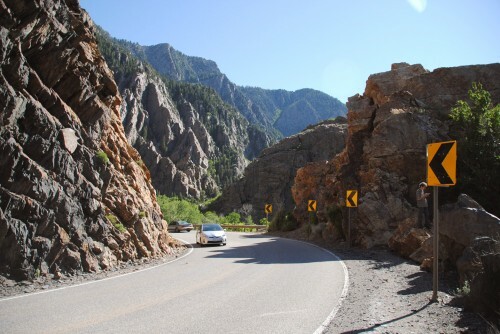 Unlike Parley’s and Little Cottonwood, Big Cottonwood Canyon hasn’t been molested by dynamite. Instead, it has a proximally intimate connection to the river and the cliffs that run through it, a distinct feature that makes for a very difficult, but enjoyable climb on a decent 12-speed bike. The next best way to travel the canyon would be by motorcycle, but with a nice shoulder, and traffic not moving too fast, it’s great via bike. Right now the waters pound the high grey cliff walls, winding and meandering like an angry silver snake. The force of the water is stunning. As soon as I pass the water treatment center I can feel the cool spray in the air, the byproduct of the impact of sheer rushing strength against hard rock. Dogwood is the first picnic area, and I stop to sit within two feet of the river and listen to the pounding angry water as it moves past like a roaring train. But even the largest locomotive can’t top Big Cottonwood River. As it undulates over rock, in small pools you see how muddy the water actually is. But as new rocks and trees are overtaken, that weren’t touched in recent years, we see its brutality: Tree limbs flail up and down under its power, begging for mercy. I dip my hands in the ice-cold water, I splash it on my face. It was probably melting snow crystals less than 48 hours ago and 5 miles away. Back on my bike up the canyon, every corner is another display of its majesty and power. I reach the Stairs Power Plant. 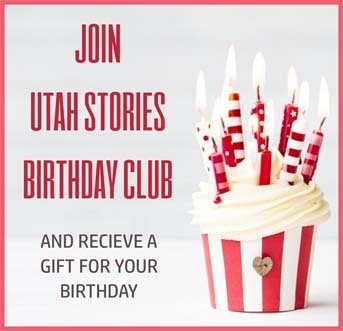 Built in 1896 and owned by PacifiCorp (formerly Utah Power and Light), it’s the only operational power generation facility left in any of the canyons. Inside the old building are new turbines, a far cry from the wooden water mill that it replaced. An old bridge goes over the water to a nice lawn. I sit and stare. “There is a private event that we are planning for here,” a guy with long hair and a goatee tells me. “I didn’t plan on attending,” I reply. Further up the canyon, I learn that the basalt cliff walls are the remnants of an ancient sea. 6 million years ago this was a drainage basin and the cliff walls are what’s left from eons of sediment build-up, compacted, solidified, then erected by thousands of earthquakes. Probably one of the most spectacular bends in any road in Utah comes next. In my field of vision are purple-gray, auburn and blue mountains shooting up, as both the river and the road bend around a monolith that was too large to remove. 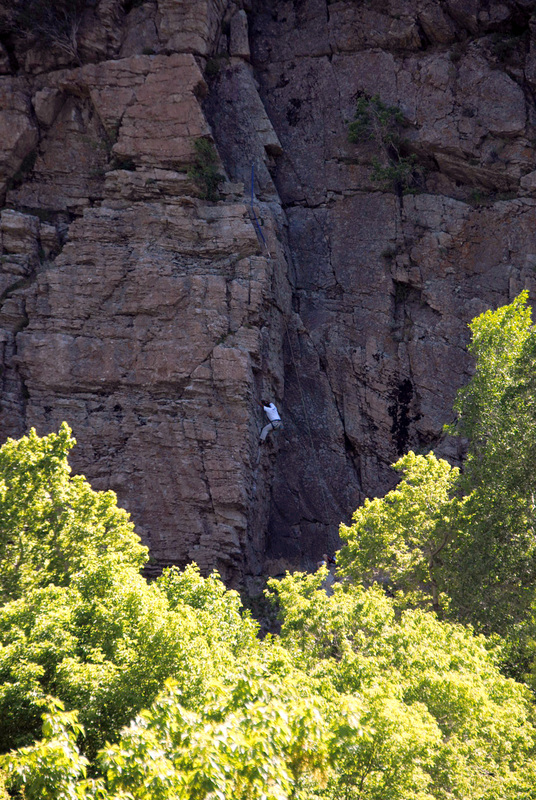 Rock climbers are overhead and across the river. Cars are parked all around. It slows the traffic. There are people hypnotized, who have stopped just to watch the water. Here the river dips far below the road, but soon reemerges and splashes against another new raised trench, just feet from the road. The spray of the water has made a mist I can feel on my hot face. Up ahead, I see yellow police tape surrounding the first casualty of the river. The Ledgemere Picnic Area has been completely overtaken. 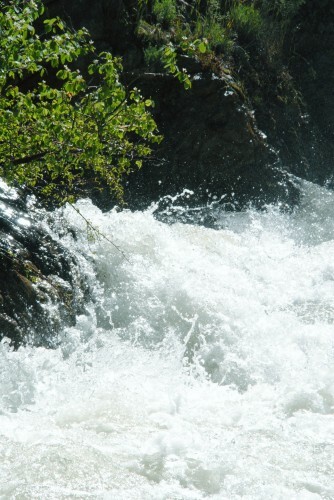 Trees are surrounded by fast-moving water. Concrete tables are islands. The bridge running over the river is taped off, but some young adults have crossed the barrier, lured into watching the water from a bridge that is now too low. They happily get sprayed as water pounds the front of the bridge. The river is running at over 800 cubic feet per second, 30 cubic feet over flood stage. By Thursday it’s expected to rise to its highest levels, but from the looks of it we have this beast under control. Further up, the river goes from fierce and mean to calm and pacifying. As the cliff walls retreat, a meadow opens up and the river meanders around in a marshy bog. 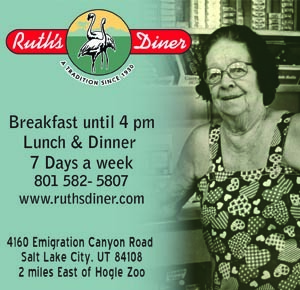 Here is one of Utah’s best fly-fishing spots. Packing their poles and picnic, a family heads for their Subaru.